This Machine Is Probably World’s Most Complicated Machine To Open A Bottle And Serve A Glass Of Wine. As exciting as it can be to crack open a wine bottle, there’s nothing fun about wandering around a party and asking other party-goers for a bottle opener. Not having a bottle opener may be a party foul, but it isn’t the end of the world. There are plenty of things around you right now that you can use to open a bottle. But this technology is nothing but crazy for opening the wine bottle. It is actually a great inventions like all other inventions, it sounds crazy but it might just work. If you want to make this complex machine, take half a ton of scrap metal, several cogs, some chains, a couple of cannonballs and lots of paper for the drawing board. But everyone will say it is like- using cannon to kill mosquito. It seems the engineer of the machine sets the bolts together into a 5ft structure resembling something out of the Chitty Chitty Bang Bang workshop. 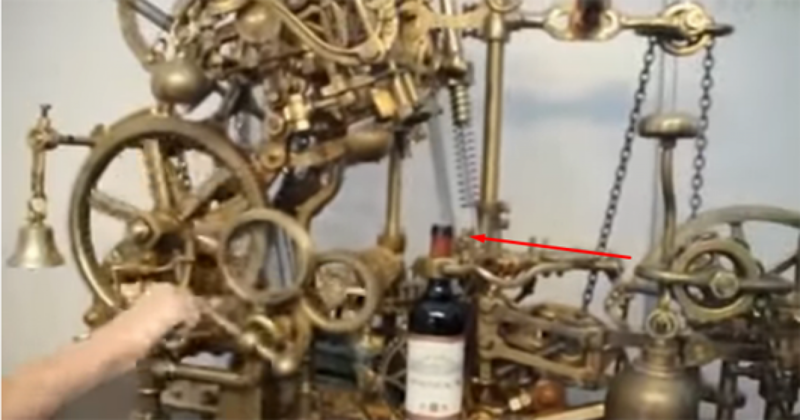 The mechanical corkscrew – a brilliant solution to a problem that didn’t really exist. It opens the wine, pours it into the glass – and even saves the cork for recycling. No one will make this machine to open the openings of wine bottle ever.